In my mind, Function Junction still embodies some of the beloved hippie-town feeling of Whistler, thirty years ago, an era when long-haired athletes braved bad facilities and non-existent services to live here year-round – eventually building a community. That same labor of love and determination is echoed in the art galleries, boutique shops, catering & delicatessens and local brewery. Function Junction is an eclectic smorgasbord of culture and awesomeness. I’m not really sure if the reason this mix of goodness set up shop in “Function” because the “industrial zone” just 7km south of the Village was more affordable – or if art inspires art, and eventually an artistic community was bound to emerge. Regardless of its roots, it’s certainly worth showing off – and once a year, that’s exactly what it does. 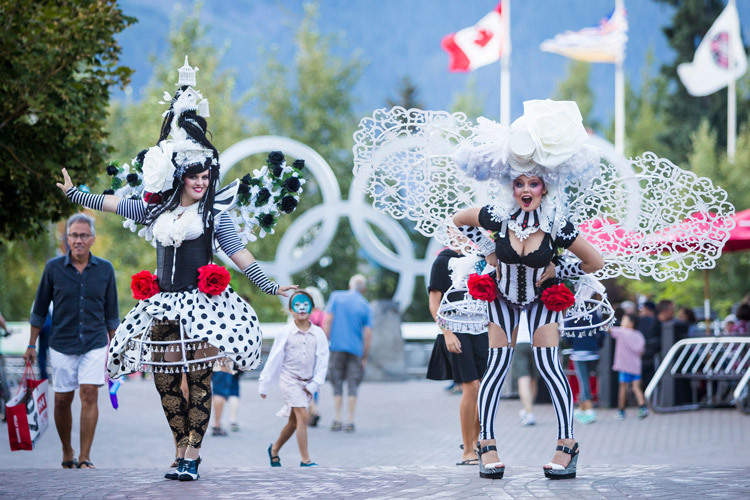 With the help of the Whistler Arts Council, an annual “Function Block Party” makes waves. An otherwise polite street is transformed, bursting with art, live music, DJ’s, food from local vendors and crazy-imaginative street entertainers. 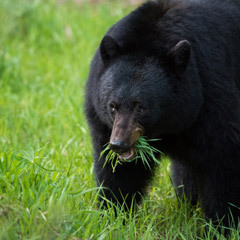 Of course, younger humans particularly enjoy this event, and they are not overlooked. This year, entertainment for the offspring took the form of a giant bouncy castle, coupled with the newly opened “Bounce” (an indoor trampoline playground extravaganza) and entertainers on stilts. My favorite was a frog – who made a habit of hiding in a ditch and had little kids following him everywhere. It’s very amusing to see people blatantly smiling as they walk passed you – just so elated in this odd atmosphere of community and art. I’m glad I captured a few photos as it would be very difficult to explain the woman wearing a table that you could paint on, or a guy with a 20-foot painting of a circus elephant. Although this event happens only once a year – the shops that step into the spotlight are there year-round. And I would boldly suggest that visiting Function Junction is a must do if you want to experience the true Whistler. – a new shop this year which has brought immense joy to my life. Try the chocolate Macaroons. Seriously. – Hang-over heaven. Bennies that will make you want to be a better person. – Mmmm. Beer. I suggest trying the grapefruit beer. – Wanna be in awe of people’s talent? Go there. – A new trampoline activity center. Fun doesn’t even begin to cover it. – A ridiculous goldmine of goodies. Our yearly transient population keeps this place brimming with finds that you’re sure must have been price-marked incorrectly.